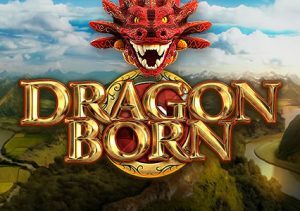 Enjoy some epic sword and sorcery adventure in Dragon Born, a 6 reel, MegaWays video slot from Big Time Gaming where the number of ways to win can reach 117,649. Look out for multiplier wilds that can fill whole reels as well as boosting payouts by up to 7x. There’s also a bonus round that can award unlimited free spin on the fully expanded reels. Play on all devices from between 20p and £10 per spin. Set against a mountaintop backdrop, you’ll see A to 9 royal values. These also come with an associated higher value symbol. For example, the 9 is partnered with the chalice. They’re joined by a fleur de lys banner and red and blue gemstones. The top standard symbol is the red dragon. Land 2, 3, 4, 5, or 6 of these on adjacent reels for a payout of 2, 5, 10, 25 or 50 times your bet. The female harlequin is the wild. She can appear on reels 2 through 6 only and substitute for all of the standard symbols. The wild can fill whole reels as well as delivering multiplier boosts. Each wild reel can provide a multiplier of up to 7x. Better still is when you land 2 wilds in the same combination. In that event, the multiplier are combined. If 2 7x multiplier wilds are in play, then the payouts rockets by 49x! The main extra is the Free Spins feature which is triggered by landing 3, 4, 5 or 6 of the diamond scatter on the same spin. You can then look forward to 6, 12, 25 or 50 free spins. These play out on the fully expanded 6 reel, 7 row machines which offers 117,649 ways to win. You’ll see single as well as stacked wilds during the feature. Each time a diamond hits, 1 extra free spin is added to your total. Landing 3 or more provides a full re-trigger. The wilds can also give multipliers up to 49x for even bigger payouts. This is a pretty straightforward for a MegaWays video slot. The stacked wilds and their associated multipliers can certainly deliver some pretty good action. As can the free spins. The variance is in the medium to high range with top wins of up to 20,000 times your bet on each free spin. The design here is a little underwhelming though with some members of the royal family looking rather peculiar. The soundtrack, in the Free Spins feature especially, has taken inspiration from Game of Thrones. This isn’t the most spectacular MegaWays game you’ll see. The odd visual misstep aside, Dragon Born is a perfectly solid game if you like the epic fantasy theme.